The AutoSum feature makes it very easy to total rows and columns using the SUM worksheet function. There is a special command button on the standard toolbar that will allow you insert the SUM function very quickly. This command button is known as the AutoSum button. 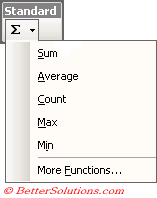 You can quickly enter the AVERAGE, COUNT, MAX or MIN functions by expanding the drop-down menu. The "More Functions" button displays the (Insert > Function) dialog box. You can also use the shortcut key (Alt + =) to quickly sum the adjacent cells. Enter your numbers in a single column into consecutive cells. Select the cell directly below your list and press the AutoSum button on the standard toolbar. The SUM() function will be entered automatically and the cells which are going to be include are highlighted with a dotted line. Press Enter to confirm. 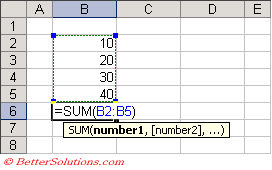 The SUM function is inserted automatically and the corresponding range of cells is entered. Enter your number in a single row into consecutive cells. Select the cell directly to the right of your list and press the AutoSum button on the standard toolbar. If you have several columns of data and would like to sum all the individual columns separately you can highlight the cells before pressing the AutoSum button. Enter some numbers into the cell range "B2:C5". Highlight the cell range directly below "B6:C6" and press the AutoSum button. 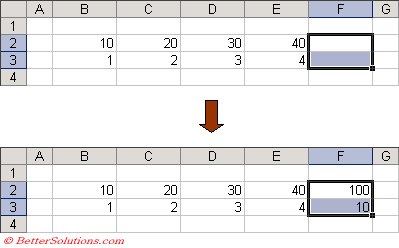 If you have several rows of data it is also possible to sum all the individual rows (or columns) separately. Enter some numbers into the cell range "B2:E3". Highlight the cell range directly on the left "F2:F3" and press the AutoSum button. If the suggested range of cells is not correct you can just drag the range to the correct cells. AutoSum will only include cells that contain a value. If any empty cells appears in a column or row then only the cells after this will be included. (Alt + =) - Enters the SUM() function using the adjacent range of cells.